Services to Suit Your Needs! Help protect your home or business by ensuring your gutters are properly installed and right for you. Help prevent damage to your home or business foundation or landscaping and give yourself peace of mind. Our gutter will add protection plus beauty to your home. For you "Do It Yourself" people or remote areas we can supply custom gutters made to length for you. PHONE FOR YOUR FREE QUOTE TODAY! 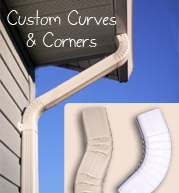 A-3 7/16" B-3 5/16" C-3 7/16"
A continuous seamless gutter that is one of the more popular choices for home owners. This style has a large bottom for a better flow and easier cleaning. This machine can also run materials such as cooper and aluminum in thicker gauges. This product comes in a wide variety of many new colors. This gutter is also compatible with our "ALU-REX" product for even less cleaning and stronger gutter. Also helps in preventing metal roofing on snowy days from taking your gutter off. 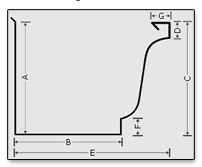 D-1" E-2" F-2 1/2" G-4 5/8"
This gutter is very popular on many new homes as it does not require the wide fascia board. This gutter is one of the stronger Fascia gutters on the market. Our Crown Fascia gutter will not only accent your home but it will also protect your home as well. This style of gutter is compatible with our "ALU-REX" product for even less cleaning and a stronger gutter. Also helps metal roofed homes from loosing their gutters on the snowy days. This product also comes in many new colors to make your home right for you. We have a specialty machine that makes the elbow that is right for you. 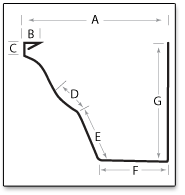 We can custom bend to fit around rock work, bricks, patio's and much more. We carry a large supply of new colors that are compatible with your siding and sofits. We use two different companies to give you a better choice in color. Our suppliers are Kaycan and Gentek.